Every now and then you find a kid's toy that just ticks all the boxes and you find the whole family having fun playing together. The Fisher Price Think & Learn Code-a-pillar does just that. The Code-a-pillar is a robotic battery operated caterpillar, to make it move you simply attach the different body pieces, as many or few as you like, and press the power button. It then does exactly what you have told it to do. Included with Code-a-pillar is 1 sound piece, 3 straight pieces, 2 right turns and 2 left turns to send it in endless directions. Gracie and Zach have had so much fun playing with Code-a-pillar, they have tried many different combinations both long and short and have figured out that the smaller his body, the less likely he is to crash! It definitely has them thinking about how it works and I am sure it won't be long until they start to realise they are actually in control of where he goes. It is such a clever toy and there are so many possibilities and different ways to play. I love the idea of setting up obstacle courses for Code-a-pillar and will definitely give it a try once they learn how to navigate it properly. Me and Andy have even enjoyed playing with them and showing them how to get it to move without crashing. I love the little victory cheer Code-a-pillar does when completing a sequence. It is really cute! I also think it is great that you can buy extra pieces which do different things like sounds and 180 degree turns. 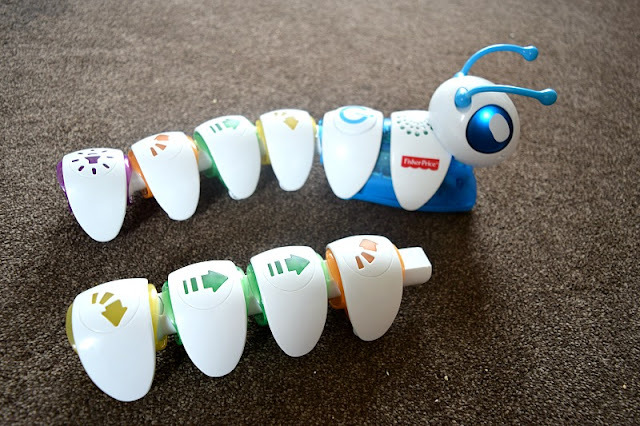 Code-a-pillar is a toy I can see being a firm favourite for a long time with the kids and their friends and we will definitely be purchasing some extra pieces to add to the fun.